US Ambassador pays courtesy call on Speaker of the National Assembly of the Co-operative Republic of Guyana. 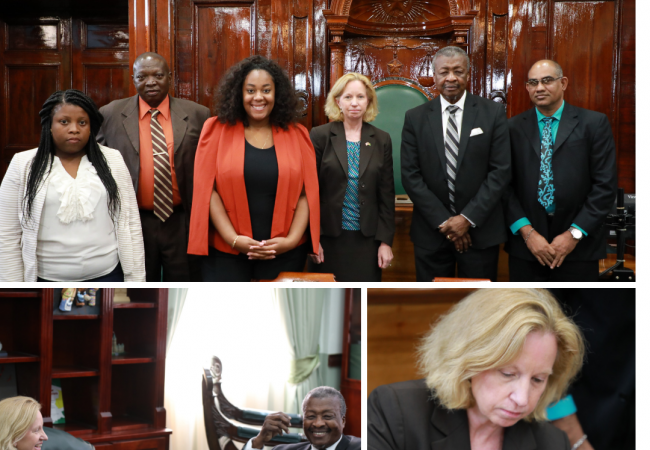 19 Mar, 2019 I Georgetown – United States Ambassador to Guyana, Her Excellency Sarah Lynch, today, paid a courtesy call on Speaker of the National Assembly Hon. Dr. Barton Scotland, O.R., C.C.H, M.P., within the Speaker’s Chamber at the Public Buildings, Brickdam, Georgetown. During the visit, their discussions focused on various issues of mutual interest aimed at strengthening relations between the two countries. Ambassador Lynch visited the Chamber of the National Assembly, where she signed the visitor’s book. On Wednesday, March 13, 2019, Ambassador Lynch presented her credentials to President David Granger.